A mortar shell - the fourth in a few days - fell in the Golan Heights in Israeli territory. The explosive hit an open area. Only hours after a mortar shell fell in the northern Golan Heights, another mortar shell was fired into Israeli territory. The shell fell in the demilitarized zone between Israel and Syria, adjacent to the border. No injuries or damage were reported. This is the fourth mortar shell that has been fired from Syria into Israeli territory over the past week, this after the third one was fired around 11:30 this morning. 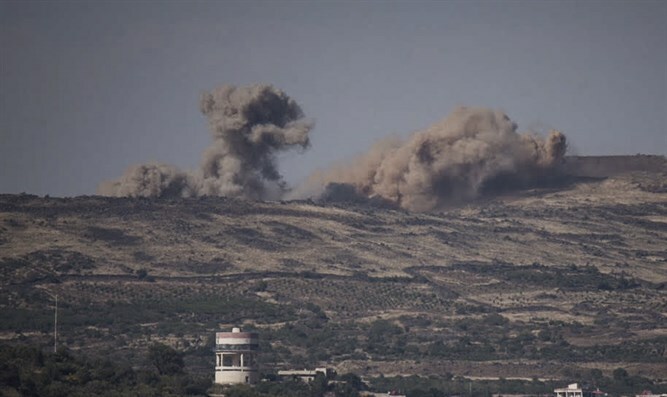 The IDF spokesman said in a statement that "in response to the trickle of fire in the northern Golan Heights, the IDF attacked artillery canons belonging to the Syrian regime, employing air strikes. The IDF views the Syrian regime as responsible for what occurs in its territory and will not tolerate any attempt to undermine Israeli sovereignty or the security of its citizens." On Wednesday evening at 6:00, an earlier mortar shell was seen falling in an open area in the Golan Heights. There were no injuries and no property was damaged. On Sunday, the IDF attacked Syrian regime military targets, this in response to the first shell that exploded in Israeli territory.